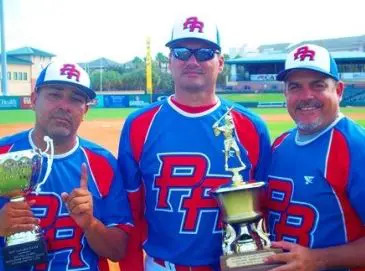 Jupiter, Fla. Nov. 10, 2013-Despite having identical 5-1 records, and despite having beat the Mifflinburg Phillies once already, the Puerto Rico Gigantes were the tournament’s number two seed entering the finals – and manager Bobby Cuevas was less than pleased. With Luis Rodriguezon the mound for the championship game, he quickly realized had no reason to be upset — especially considering this was a homecoming of sorts for his dominant righty. Rodriguez retired 14 of the first 15 hitters in a two-hit, one-run complete-game masterpiece as the Gigantes defeated the Mifflinburg Phillies 8-1 for their second Fall Classic Championship in three years. Cuevas’ dismay began after his Gigantes and Phillies finished in a three-way tie with the Atlanta Rangers after round-robin play. Cuevas argued his team should have been the top seed due to its 5-3 victory over Mifflinburg earlier in the tournament. Instead, because the Gigantes lost to Atlanta and Mifflinburg didn’t play the Rangers, a run-differential tiebreaker determined the playoff seeding, with the Phillies earning the spot based on least runs allowed. The Gigantes, who went 4-1 in round-robin play and beat Atlanta 10-6 in the playoffs, scored their first two runs via a pair of errors and a Juan Montero sacrifice fly to center. Puerto Rico added a run in the third, two in the fourth and blew the game open with a three-run fifth to cruise to victory. All the while, Rodriguez kept dominating. The man who got the final three outs of Puerto Rico’s title two years ago and already earned a victory in this tournament, was at his best. Mixing his pitches well and staying ahead in the count, Rodriguez didn’t allow a hit until Bob Smoker’s sharp single to center with two outs in the fifth. Chuck Roehm singled to deep shortstop to open the seventh for the only other hit. The Phillies didn’t have a runner reach third until Brian Ramsey scored on Ken Connor’s ground out with one out in the ninth. For Rodriguez, who moved to Orlando this year and was named team co-MVP with Juan Montero, it was his first opportunity to pitch with the Gigantes since last year’s Fall Classic. That fact was not lost on him following the outstanding effort. “This was a tremendous opportunity to be a part of this team again,” Gonzalez said through an interpreter. “The first two runs were big for me and pitching earlier in the tournament gave me a lot of confidence. For the Phillies, who finished round robin play 4-1, before defeating the Oilers BBC 5-2 in the playoffs, losing a third straight tournament final and fourth consecutive game to Puerto Rico, was almost as disappointing as the way they lost.